When some time ago I was exchanging emails about me coming to the event with Arthur Motley from The Royal Mile Whiskies, I said “sure, I’ll pop in”… Arthur was ever so slightly offended “you’ll pop in? I suggest more of a campaign mentality”. And I followed. Well rested, with my belly full of greasy food, I headed to the New Town with as much of a campaign head on as I could muster around lunch time. Here is a message for our dear government: Leave us alone, do not dictate us when and where to enjoy a drink. We are perfectly capable of taking care of ourselves! What else can I say? 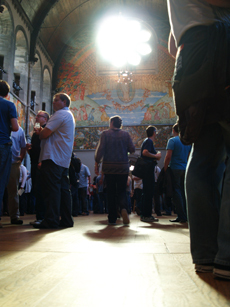 Better get your Whisky Fringe 2010 tickets sorted! They will go on sale on 1st December. *The famous Arran distillery peacock, Albert, apparently did a runner from the grounds a couple of days ago, which coincided with the launch of the whisky dedicated to him. Well funny (although smells to me a bit like marketing peacockshit, but never mind). This entry was posted	on Thursday, August 20th, 2009 at 9:13 am	and is filed under Events. You can follow any responses to this entry through the RSS 2.0 feed. Responses are currently closed, but you can trackback from your own site.